Director – Tim Hill, Screenplay – Will McRobb, Chris Viscardi & Jon Vitti, Story – Jon Vitti, Based on the Characters Created by Ross Bagdasarian, Producers – Ross Bagdasarian Jr, Janice Karman & Steve Waterman, Photography – Peter Lyons Collister, Music – Christopher Lennertz, Music Supervisor – Julianne Jordan, Animation Director – Chris Bailey, Visual Effects – Rhythm & Hues (Supervisor – Todd Shifflett), Special Effects Supervisor – Alan E. Lorimer, Production Design – Richard Holland. Production Company – Fox 2000 Pictures/Regency Enterprises/Bagdasarian Productions/Dune Entertainment III, LLC. Dave Seville is failing badly in his efforts to make it as a songwriter, especially after his college friend Ian Hawke, the head of Jett Records, fires him for failing to come up with any worthwhile material. On the way out, Dave picks up a gift basket and unknown to him carries home three chipmunks whose tree was cut down to become the Christmas tree in the lobby of the building. Dave is amazed to find that the chipmunks, Alvin, Simon and Theodore, can talk. He lets them stay in his house but is horrified when their playfulness causes complete chaos. He throws them out but then discovers that they can sing in their high-pitched voices. Dave tries to sell Ian the idea of a chipmunk Christmas song but the chipmunks have stage fright when it comes to performing. Ashamed after causing the latest upset in Dave’s house, the chipmunks go and perform for Ian. He promptly signs them up and turns them into an overnight sensation under the name Alvin and the Chipmunks. However, Ian also manipulates them to leave Dave and come with him. There Dave milks the chipmunks for all the money that he can make off them to the point that they are exhausted. Alvin and the Chipmunks were originally a recording phenomenon. Created by Ross Bagdasarian and initially appearing under the name Dave Seville and the Chipmunks, Bagdasarian put together a Christmas record The Chipmunk Song (1959) using ordinary singing voices played sped-up to create the high-pitched voices of the chipmunks. The song was a hit and the Chipmunks soon became a mass phenomenon. Bagdasarian even used to perform the songs live using puppets to play the chipmunks. 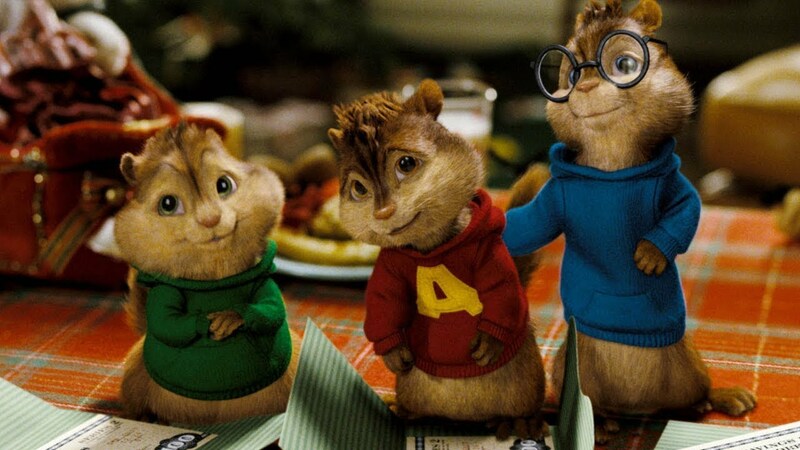 There have been to date some 40 Alvin and the Chipmunks records released. The concept was later spun out into an animated tv series The Alvin Show (1961-2), although this was not a huge success. After Ross Bagdasarian’s death in 1972, the copyright was taken over by his son Ross Bagdasarian Jr who mounted the successful animated tv series Alvin and the Chipmunks (1983-90). (In later seasons, this was renamed The Chipmunks Go to the Movies with each episode spoofing a popular film hit). This also led to several animated film spinoffs with the theatrically released The Chipmunk Adventure (1987) and a host of tv specials including Alvin and the Chipmunks Meet Frankenstein (1999), Alvin and the Chipmunks Meet the Wolfman (2000), Little Alvin and the Mini-Munks (2003) and then of course this live-action film. Here Alvin and the Chipmunks follows in the wake of Babe (1995), which had the novel idea of creating animated talking animal frolics in live-action using animatronics and CGI effects. Other such live-action talking animal efforts have since included 101 Dalmatians (1996), MouseHunt (1997), Dr. Dolittle (1998), Stuart Little (1999), Animal Farm (1999), Cats & Dogs (2001), Garfield (2004), Racing Stripes (2005), Charlotte’s Web (2006), Underdog (2007), Beverly Hills Chihuahua (2008), G-Force (2009), Furry Vengeance (2010), Yogi Bear (2010), Hop (2011), Zookeeper (2011), Paddington (2014), The Jungle Book (2016), Christopher Robin (2018), Peter Rabbit (2018), Watership Down (2018), Dumbo (2019) and The Lion King (2019). Indeed, director Tim Hill seems to have specialised in these kinds of live-action talking animal frolics, having previously directed Muppets from Space (1999), Garfield: A Tale of Two Kitties (2004) and subsequently Hop (2011) with a talking Easter Bunny and Grumpy Cat’s Worst Christmas Ever (2014), as well as written the animated The Spongebob Squarepants Movie (2004), which could probably be considered a talking animal film if anyone can ever work out what species Spongebob is, and produced the live-action tv series 100 Deeds for Eddie McDowd (1999-2002) concerning a teen who is turned into a dog plus the film version of Walking With Dinosaurs (2013). Alvin and the Chipmunks is symptomatic of all the worst parts about these live-action talking animal fantasies – cute talking animals throwing off irritatingly smartass one-liners like bad stand-up comics; lots of cutsie scenes with them frolicking and running around, doing human-like things; and especially the animals making lots of contemporary culture reference gags. This latter is highly inconsistent depending on the requirements of the gag of the moment – one minute the chipmunks are innocent about the ways of human culture and technology, the next they are firing off gags about healthcare plans and singing human pop songs. There are a good many poop and goo jokes. The trailer for the film has my back up even before I went in the door and the squeaky high-pitched helium balloon voices of the chipmunks started to become incredibly irritating after about five minutes of watching the film. Alvin and the Chipmunks is not a whole lot different to films like Kindergarten Cop (1990), Daddy Day Care (2003), The Pacifier (2005), The Game Plan (2007) and The Spy Next Door (2010) where a curmudgeonly guy is foisted with the care of a group of unruly youngsters and eventually softens up and comes to have feelings for/learns to act as parental substitute for them. Almost the whole of Alvin and the Chipmunks takes place in a series of tiresome scenes with the chipmunks running riot and causing mess and chaos with whatever they do and parental substitute Jason Lee tearing his hair out. In fact, if you look at it as being about a substitute father and kids, the film could be considered as a 90-minute advertisement for why we need Ritalin. The plot also has a strong message about the chipmunks being taken advantage of by a greedy record company executive and milked for all they are worth to the point of exhaustion, which might have a moral point except for the gaping hypocrisy of the fact that the concept of Alvin and the Chipmunks has been nothing but a marketing exercise from Day One. The sequels were Alvin and the Chipmunks: The Squeakquel (2009), Alvin and the Chipmunks: Chipwrecked (2011) and Alvin and the Chipmunks: The Road Chip (2015). Alvin and the Chipmunks was parodied in Disaster Movie (2008). (Winner in this site’s Worst Films of 2007 list).